Properties are additional information that are attached with any created event. Events may include viewing any particular screen, adding something in the cart, signing up, or simply checking out the menu. Event properties may include additional information such as the name of the screen, name of the item added in the cart, mode of signing up or the information on the menu button clicked. There are 3 types of properties that can be attached to any event viz. Event Properties, User Properties, and Super Properties. It is always good to have a single view where you can see all kind of properties along with their recorded values related to an event or a user or a device. If you know the property values, it is always easy to analyse the user behavior based on it. This is the place where you can find the complete list of all kind of properties recorded till now. 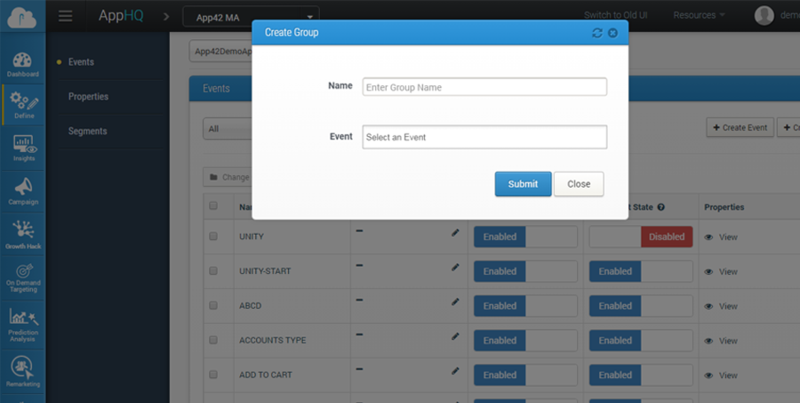 Event properties are the meta attributes that you would like to assign to your created event. For example, if you create an event called Product Viewed, then the event property can be Product Type and the value of the same can be any particular brand. These can be edited anytime as per the requirement. Super properties are channel related attributes. Simply put, they capture the complete information of the channel the event is triggered from, such as OS, OS version, carrier, device brand, model, etc. You need not worry about these as they are automatically captured through our SDK and added to the event request before being sent to the server. As the name suggests, these are user related attributes such as gender, age, location, profession or contact details. This helps in creating campaigns where you can segment users based on their demography and take a deep dive into the user attributes for pin pointed push/in-app/email campaigns.